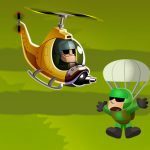 In this fun-filled shooting survival game, you can choose your own role, such as police, soldiers, farmers… Choose the right place for skydiving, and collect weapons and equipment scattered around the map after landing. You must be careful enough because the enemy may be hidden everywhere. Defeat all enemies to win the battle. Good luck!